Jon Abrahams’ directorial debut is a film you've seen before. It travels a familiar path that heads towards a forgone conclusion, yet the journey is a sublime exploration of parenthood, loss, and Sylvester Stallone. 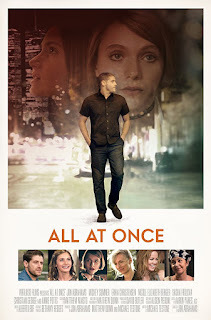 All at Once is a quasi-romantic-coming of age story that feels like a relic of the 90's New York experience. Featuring a delightful ensemble performance, crisp cinematography, and a smile inducing soundtrack, this is one of 2018's first genuine entries. While it doesn't add anything new to the genre, it presents its subject matter with integrity and heart, two undeniable strengths that pervade throughout. James is an up and coming artist in New York who gains custody of his best friends' children when they perish in the 9/11 terrorist attacks. After losing his job as an art teacher due to budget cuts, James relocates his makeshift family to Buffalo, amidst his daughters' growing adolescent quandaries. Abrahams also stars with a script penned by Michael Testone. The dialogue is organic, profanity laced poetry that swirls around a somber core of lost opportunities and the blessings of family. Abrahams does a remarkable job as James, a quietly harried father who does the right thing, only to retreat within himself, abandoning his life's passion and holding those who care for him at arm's length. The brilliance of his performance is that these truths aren't evident. They lie underneath a surface of fatherly bravado and artistic understanding. James is a man who was thrust into a different life and he takes his paternal mantle without question....and it's killing him, but not in a clichéd drugs and alcohol way. This is All at Once's magnificent heart. James' struggles are natural, things biological and adoptive parents grapple with daily, and Abrahams' endearing embrace of this is what makes the experience unforgettable. The supporting cast is a veritable who's who of character actors. Annie Potts (Ghostbusters), Erika Christensen (Traffic/Parenthood), Jason Biggs, Stephen Henderson, and Scott Caan round out the cast, with each doing solid work with their limited screen time. James' daughters, portrayed by Nicole Elizabeth Berger and Sasha Frolova, embody the perfect mix of childlike vulnerability and teenage rebellion, supplying melancholy when required and subtle insight in between. However, Christian George steals (admittedly easily) the spotlight with Lou, James' childhood friend and dispenser of profane wisdom. His religious adherence to the teachings of the almighty Sly is both hilarious and unexpectedly warm, harnessing the authenticity of Italian-American culture. This a real community, people who have experienced the worst of life and yet strive towards the light at every turn. While it occasionally dips into the Hallmark treatment, Abrahams' ability to coax real emotions from his cast while framing the outright absurdity of everyday life is commendable. Matthew Quinn's luminous cinematography captures the story with intimate close ups and tightly framed compositions. The temptation to frame the outside world with lonely wide shots of still life is low hanging fruit in an indie film, and Quinn and Abrahams' resistance accentuates the simplicity of the story. In the make or break it aggregate review world of cinema, large set pieces, and scenes of emotional devastation are essential, and All at Once bucks this trend with panache, displaying everything as a snapshot of life in progress. This is highlighted by a fresh score and pop laced soundtrack that swirls around the characters in virtually every scene. In particular, there is a musical sequence involving three fathers descending on a teenage bacchanal that will have any parent of a teenager smiling in recognition. 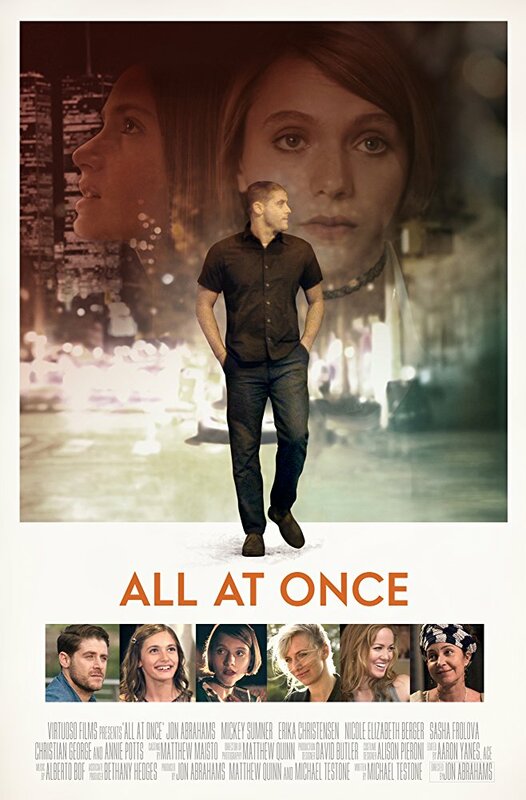 Coming soon to digital on demand, All at Once is a low-key triumph. It's messy, funny, and tragic: a mirror of the life of ordinary men and women who do the best with the hands they've been dealt. Abrahams' confident direction, paired with a sensational cast and pitch perfect music, delivers a heartwarming pick me up that will recharge the soul.